A carefree feel envelopes Les Voiles d’Anjou: a wide variety of facilities await you here for calm and pleasant holidays in the Maine-et-Loire. Everything you need to fully enjoy your stay with total peace of mind! Take advantage of a fully customised stay with our concierge service. With hamburgers, pizzas and plenty more to choose from, our takeaway options are all prepared with produce from the village. And to make your holidays that much simpler, the campsite also has a postal service available, as well as a fresh bread outlet and a little grocer's selling day-to-day items. Are you looking for tourist information, a taxi, a babysitter, or maybe you need to rent a car or hire a bike? The campsite reception is there to find solutions for all your needs. We also have a postal service. During your stay, you can use Wi-Fi to stay connected to your friends and share your best holiday experiences (30 minutes free per day)! Feeling peckish? During July and August and at various other times during the low season, you'll be pleased to know there's a snack bar available in the campsite.. What could be better than gathering there with family or friends for a drink and enjoying a simple, relaxed moment during your holiday? It also has a take-out service, pizzas and even local products! 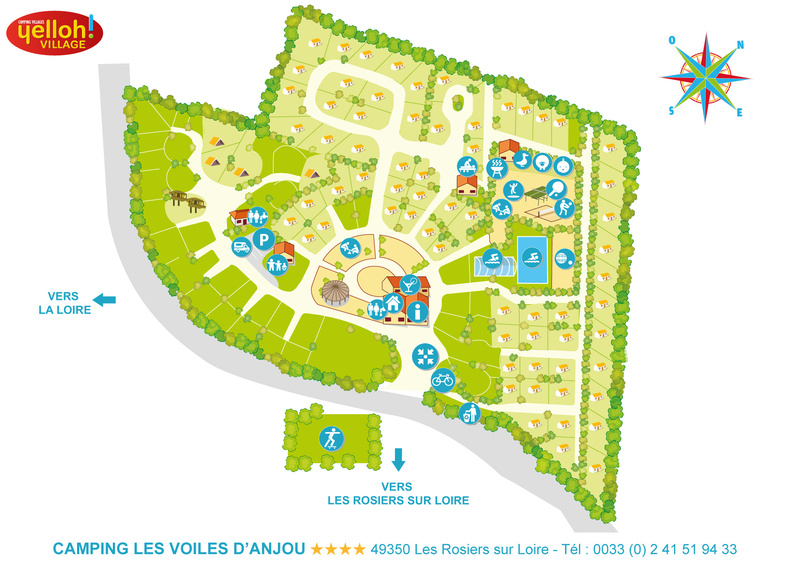 The campsite is just 800 metres from the centre of Les Rosiers-sur-Loire, so you will be able to profit from all the local facilities: grocery store, chemist, butcher, newsagent, etc. as well as doctors’ surgeries, post office, banks, tourist office and bike rental.